CLEVELAND, Texas, Oct. 19, 2018 /Christian Newswire/ -- Numerous books focus on an apparent absence of any proof of God in scientific investigations, maintaining that the concept of God does not stand up to critical thinking. Pastor Gary Driver takes the opposite approach in God Answers Science, providing a bridge between two seemingly opposite perspectives and using numerous scientific phenomena to illustrate why its contentions actually affirm God's existence. God's claim as the creator of the universe is the greatest claim that can be made. This argument is reinforced by chapters that link scientific facts to historical biblical predictions. As in the widely accepted energy/mass duality (E=MC2) of the Big Bang Theory at creation that reinforces the Biblical origin description of the same made in 63 A.D. Origin and beginning (Genesis 1:1) are not the same. This book addresses the cosmogony, origin, beginning, including cosmic inflation, Higgs field, elementary particles of the first second of the universe; all predicted by the Bible. The subtitle From Origin to End represents the extent of the biblical/scientific journey of the universe the reader will experience. This book integrates the Biblical history in the Genesis account with the five major and five minor mass extinctions of the fossil record within the eons of Earth's formation. At the same time revealing the Bible's claim that we are indeed made of stardust. God Answers Science pairs the analytical approach of science with the contentions of Biblical history to bridge two seemingly-opposing worlds, giving modern thinkers supportive passages, scientific evidence, and perspectives to defend their faith against those who attempt to use science to marginalize the Christian faith. God Answers Science (237 Pages) is published in softcover (ISBN: 978-0985278359) and eBook (ASIN: B07F639LC1). Available at Amazon. Bishop Driver is a third-generation pastor. He is the senior pastor of C.C. Driver Revival Center of Cleveland Texas and has been for 15 years. Married for over 35 years, he and his wife Shere have five children, nine grandchildren. He is the author of three books of the faith; Two Have and Two Hold, a book on marriage; and What is Time, a biblical perspective. 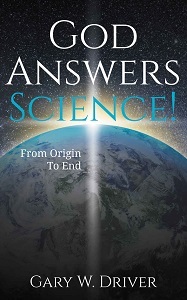 His latest work is God Answers Science, From Origin to End. He has enjoyed a career in the controls automation industry and is currently a senior project manager.